I’m in a bookclub again! As longtime readers will know, I ran a bookclub for friends for a number of years, but it petered out and I haven’t been a part of one for the last 3 years or so. But, recently I was out with some girls, talking about book recommendations, and one of the ladies said, why don’t we have a bookclub? And I said, hell yeah! I’m not running the club this time around, which is nice, but I am an active participant. A group of ladies got together, came up with a book list, and last month we had our first discussion. It was very emotionally rewarding for me. I love reading so much, but often don’t have anyone to discuss the books with when I finish one. We talked theories, themes, characters, and the vision of the future. It was awesome. And, we drank wine and ate lots of cheese. So, a win all around. Anyways, let’s talk about the actual book! Have you heard of this book? 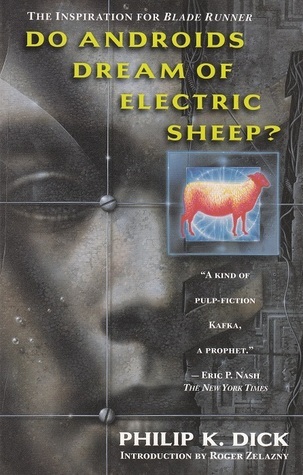 If not, you have surely heard of the movie based on the book, “Blade Runner”. Amusingly, I’ve never been able to make it all the way through Blade Runner without falling asleep. It just doesn’t do it for me. And I love Harrison Ford and sci-fi movies! What’s up with that!? However, the book was delicious. I raced right through it. It is gripping, heavy on dialogue, and has an interesting, complex, and disturbing view of the future. The protagonist is Rick Deckard, a bounty hunter charged with finding and “retiring” runaway androids that are loose on earth. The androids that he is chasing are a new type, Nexus 6, that are nearly impossible to distinguish from humans. The book, through Rick, explores the idea of what it is to be alive. If an android is nearly indistinguishable from a human, then what right do humans have to kill it? Is it killing or retiring? This theme is also explored by the discussion of Mercerism, the main religion/belief system established in the book. People have a Mercer box in their homes that they connect their consciousnesses to. When they do that, they merge with all other people operating their boxes at the same time. It allows humans to connect, practice empathy, and develop a deeper appreciation for all life. Humans, in this future, see protecting life as one of the most important things. The planet is a nuclear wasteland where there is no wildlife anymore. Pets are used to define social status and give meaning to an otherwise bleak life on earth. Mercerism draws an interesting parallel to the android saga. The main difference between humans and androids in the book, is that the androids are unable to feel empathy. Because of this defining trait, they are deemed not alive. The humans value life, but not the lives of androids. The book is a fascinating read and a bleak, but insightful look at a possible future. It is amazing that it was written so long ago, but is still relevant to conversations surrounding artificial intelligence, potential rights of artificial intelligence, and what it means to be human and alive. There are many other fun things about the book. Insights into possible future inventions as well as the use of things that are now so outdated that it is amusing to see them in a future setting. If you haven’t ever read this book, I highly recommend it. It is short, fun, and may just blow your mind.